pique a boo: The Avatar Saved The World. Who Will Save The Avatar? The Avatar Saved The World. Who Will Save The Avatar? I love cartoons. I always have. Cartoons are art worth imitating. There's usually a lesson. No one stays angry. No one stays hurt. There are laughs and pretty colors. My love of cartoons has kept me watching Nickelodeon, Cartoon Network, Toon Disney, and The Family Channel years after most people would have moved to more adult (or teen) channels. It helps me forget the things I hear and work and gives me a strong connection to my brother Ty. I've seen bad cartoons come and good ones go. One of my absolute favorites is Avatar, The Last Airbender. It was a series that had an end and now it's going to be a live-action movie. I was disappointed when I heard that - I would have preferred a cartoon movie. Today I learned more. And now I'm angry. Let's ignore Dev Patel (global sweetheart) as Prince Zuko (driven / ruthless exile) for a moment to look at the original Katara and Sokka. They're clearly brown. The actors playing them clearly are not. This is not okay. I don't even know if I can explain it without a rant, but I will try. There's no reason to make the brown people white. I'm outraged on two fronts. Firstly, My media classes taught me about this mainstream racism and my nostrils flare when I see it. Secondly, as a fan, white actors are not true to the story. It's bad enough it's not going to be a cartoon. Changing the look of characters makes a different movie altogether. No. The ethnicity of the characters is not integral to the story. It's never mentioned and is never an issue. Theoretically they could have all been white, but they weren't. The cultures, the bending, the clothing all have what I would call Asian / Native American influences. The people behind a successful series designed the heroes that best fit within the world they imagined. It's not up to Paramount to change that. I mean it apparently is since it's been done, but it's not right and now I'm going to have to boycott a movie about which I was started to get excited. Paramount is using the classically Disney "white is good, dark is bad" perception that makes me unable to watch "The Little Mermaid." Overweight dark skinned villain? No thanks. I prefer my villains to be blond. Only I can't seem to think of any - from any kids' movie. Ever. I mean really. If Mufasa and Scar were brothers, why was Scar so much darker? Disney has grown. We're about to see our first black heroine. Yes, her love interest is a frog, and no I have not seen the coloring of her villain, but it's a significant step. Now Paramount is regressing. Anime fans and Asians are angry. Boycotts are being organized, and I will be buying a t-shirt. 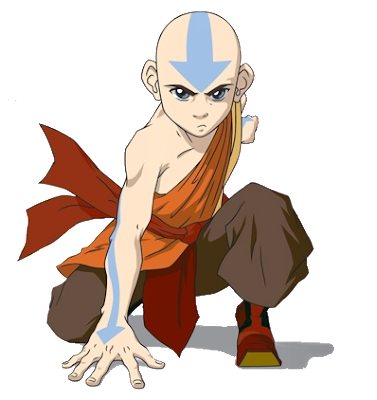 I guess I'm an "Avatar Purist." I'm also against racism. The kids from "The Chronicles of Narnia" are white, and that's how they were written. I would not expect Superman to be black. I don't want Spiderman to be Mexican. Minorities have so few superheroes. It's just rude to take away three who have a loyal fan base. It's disappointing, and I'm sending tweets to a Paramount producer (@LeDoctor) and I'm hoping to effect change. I'll keep you updated. All this Avatar talk has reminded me how much I love the show. I'm off to find at least the series finale - which was better than awesome. woah... never saw the little mermaid? she's big b/c she's an octopus! and she's not dark - she's purple! ugh.. i loved the little mermaid - i mean there's an adorable talking crab - how can you not love that?? 1. i had to watch most of it while baby sitting for eric. 2. she's not lilac, kmc, she's dark. she lives in the dark. she's plump in ways that are typical of black women. her features are drawn different from every other character. 3. she's an octopus. she could have been an urchin. 4. that talking crab had overtly big (typically black) lips, poor english, a heavy accent, and a devout fear of his master. hmmm. what's not racist? it's not blatant. it's supposed to be subliminal because it's for kids. Saved only if it's meant to be seen as a comedy, not as an adaptation of the well-loved TV series, or seen by those with the "I see dead people" mentality, imagining and seeing things others don't! This film is a bad joke on Asian anime and cultures, and on the animated TV series. Just look at the comparison of the three characters to the anime characters. One would have to possess the "I see dead people" mentality to imagine and see the actors as impressive representation s of the anime characters!